Sacramento! 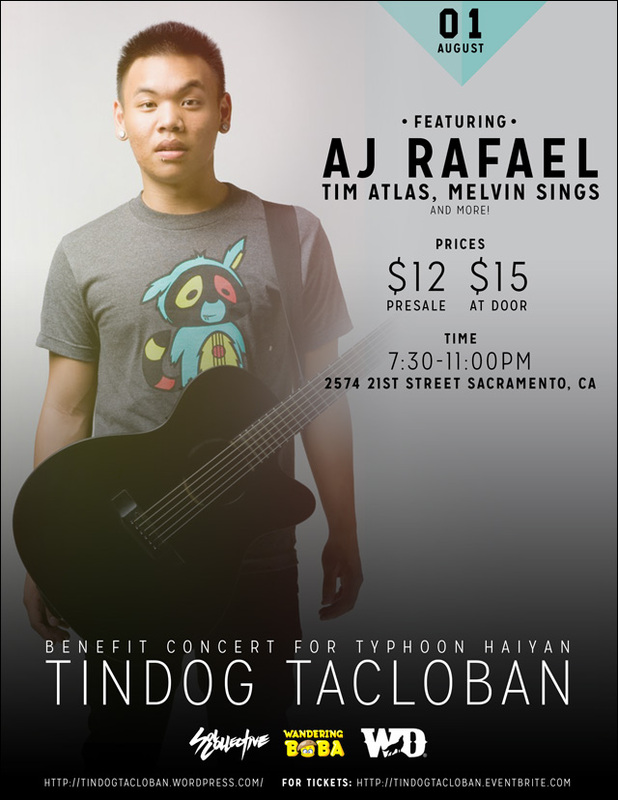 Two sisters in your 'hood have put together a benefit concert to help raise funds towards education equipment for survivors of Typhoon Haiyan: Tindog Tacloban II. The next one is happening on Friday, August 1 at Sol Collective, and will feature AJ Rafael (who, we have been told, will go on an indefinite hiatus soon), Tim Atlas, Melvin Sings, and more. Tindog Tacloban II: Music for Education, featuring: AJ Rafael and more! This event is the second show in our efforts to help the survivors of Typhoon Haiyan. This will be Part 1 of a 2-Part series concert (the next will be held October 2014 and will highlight hip-hop artists). PURPOSE: To raise money to buy a laptop and desktop computer to help re-build a computer lab at Leyte National High School (the main high school campus in Tacloban City, which was heavily destroyed by Typhoon Haiyan). With the aftermath of the typhoon, many schools were destroyed, including equipment and resources for students. THE SHOW: 100% of the proceeds from ticket sales will be used to buy the laptop & desktop computer to be shipped directly to Tacloban. Any extra money will be used towards purchasing school supplies/books for the students of Leyte National High School. We will also be accepting physical goods (canned food/clothing/first aid) if donors choose to help that way. Tickets are $12 and can be purchased here. For further information about the evening's performers and other relevant details, visit the Facebook event page.